Big Southern Charm – art. college. life. 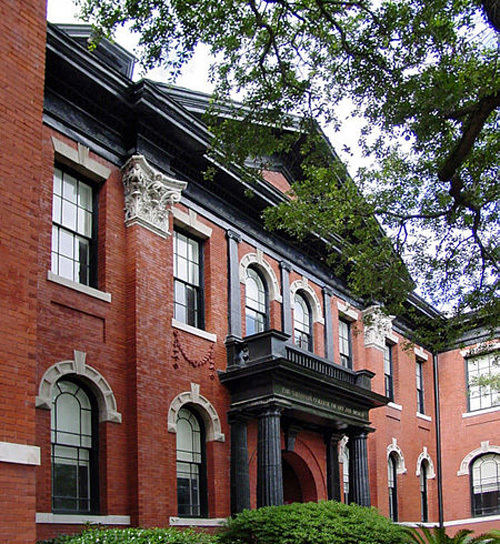 Savannah College of Art and Design (SCAD) is a large art and design school. Try 8,000 students large. And that’s just in Savannah. SCAD also has campuses in Atlanta, Hong Kong, and Lacoste, France. With all that bigness you’d expect a lot of options, right? Right. The art and design school offers over 40 majors, including Furniture Design, Television Production and Equestrian Studies, and many are interchangeable throughout their four campuses. That means you may be able to switch campuses without affecting your major. So, what about quality of education? Well, they must be doing something right. DesignIntelligence ranked SCAD’s interior design program the top in the country this year – for undergraduate and graduate work. In 2011 the Huffington Post named SCAD’s fashion design program number one in the country. And to mix things up a bit, SCAD was the first art and design college to offer comprehensive intercollegiate athletics. That means you can focus on your portrait and abstract painting courses as well as compete with the Lacrosse or Cross Country teams. SCAD events are big as well. Their signature event, the Savannah Film Festival, just celebrated its 15th year bringing famous filmmakers and actors to the city for interactive lectures, workshops and films. The main campus is fully integrated into one of the largest and most well-known landmark districts in the country. Downtown’s grid-and-park system, lined with beautiful live oaks, envelops students and visitors in southern charm. The school has gone to great lengths to restore and renovate numerous historic structures into workable and livable contemporary spaces for SCAD students. In fact the college’s first academic building, which started out as the Savannah Volunteer Guard Armory, was originally constructed in 1892. Because the school is so well incorporated into the city there is not a well-defined campus with traditional grounds. Consequently, student living is a bit scattered. Most students live off-campus, outside of residence halls. SCAD works on a rolling admission – that means you can apply pretty much all year long, and you won’t have to wait for a pre-determined date to find out whether or not you’re accepted. They’ll let you know soon after you apply. The bulk of applications are received in January and February. Last year’s acceptance rate was 63%. If you’d like to check out the place before you submit an application (which I highly recommend! ), try to visit during their next “SCAD Day,” January 12, 2013. It’s designed to be a full day of exploring and experiencing all the school has to offer. If you can’t make the trip, call the school with any questions you may have. Admissions representative and alum Corey Green was very helpful. If everyone else is as enthusiastic about the school, you’ll be in good hands. ← Graphic Design – Where Will It Lead?